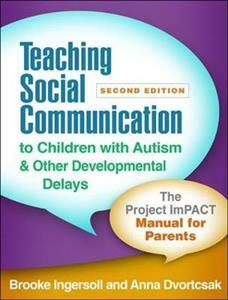 Recognized as one of the most effective coaching programs for parents of young children (up to age 6) with autism spectrum disorder (ASD) and related social communication delays, this two-book set has been fully revised and updated. It presents everything needed to implement Project ImPACT, an intervention curriculum that teaches parents ways to enhance children's social engagement, communication, imitation, and play skills, within meaningful activities and daily routines. The Guide to Coaching Parents provides a complete introduction and step-by-step coaching procedures for practitioners working with individual parents or groups. The Manual for Parents, which includes 20 reproducible forms, helps parents master the strategies and use them at home. Both volumes have a convenient large-size format. Copies of the parent manual are also sold separately (ISBN 978-1-4625-3808-9). Companion Websites Purchasers get access to a companion website featuring 42 reproducible forms for practitioners and parents (20 of which can be filled in onscreen before printing), as well as video clips of the techniques and PowerPoint slides for use in teaching parent groups. A second companion website for parents features the parent forms and video clips only. New to This Edition *Reflects the latest research and the ongoing development of Project ImPACT. *Streamlines the program for teaching parents--presents five main strategies that build on each other. *Appropriate for a broader range of children, including those without an ASD diagnosis who have social communication delays. *Optional unit on managing significant behavioral challenges. *Additional visuals, graphics, and forms that facilitate learning. *Expanded information on engaging parents, goal development, data collection, and adapting the program for a variety of settings.